When I was first introduced to the Enneagram, we got only the bad stuff — the distortions, fixations, compulsions, exaggerations, vices, bad breath, etc. When I, in turn, presented the Enneagram styles this way, people would ask: “Isn’t there anything good about any of these types?” Apparently there wasn’t. So I started to wonder: “Well, what is good about these styles?” Is there something at the core of each style that maybe got distorted by its exaggerated expression? I always liked the ancient Greek notion of sin or fault as hamartia, missing the mark. If you aim at a target, but your arrow or gun barrel is bent, you’ll miss the target. Sin or disorder is being “bent.” Bent doesn’t describe the first state of anything. It implies there was a previous condition. And bent contains possibilities of a future condition: being restored to the original state, remaining the same, or becoming more bent to the point of breaking. Evil isn’t a separate entity. It’s the corruption of an original good which is susceptible to a possible redemption. Sin and disorder are theological and psychological labels, respectively, for this corruption. When the neurosis is discovered to be an exaggerated version of health, the patient feels less shame and more hopeful. So what got distorted in the Enneagram styles? What’s the healthy core that ended up misshapen? To know who you really are, go back the way you came. Start with the exaggerated, bent expression of the self and trace it back to its original state. What does each style really want? What’s of value and importance to each style? And what caused the original valued quality or state to be distorted? The answer to the first two questions leads to the values of each style; the response to the last question points to the vulnerabilities of each style. If we use a theological paradigm to consider human nature, we might say that each of us is an epiphany of the Divine. From a spiritual point of view, Divinity descends and shows itself through earthly manifestations. While each person, as a child of God, contains all of the characteristics of Divinity, it is our destiny to manifest one or a few of God’s features in a particularly clear fashion. Just as we often say of our human lineage: “She is just like her father;” or “He is just like his mother;” and then go on to specify: “He has his father’s humor;” or “She has her mother’s kindness;” so can we comment about our Divine parentage. In most religious traditions, God has been variously characterized as Good, Loving, Creator, Original, Wise, Loyal, Joyful, Powerful, Peaceful, etc. While every human person possesses these facets of Divinity, some types are particularly attracted to and spontaneously show forth certain of these attributes. For example, some people are naturally inclined towards being good and perfect as their heavenly father is perfect; while others naturally manifest and are drawn to being loving, or productive, or unique, or wise, or faithful, or playful, or strong, or harmonious. 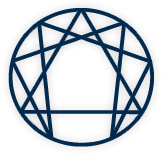 The Enneagram paradigm sorts the characteristics of Divinity into nine clusters. This is a convention of the system and doesn’t imply it is the only way of thinking about God and certainly doesn’t intend to tell God this is the only way she, he, it, or they can appear. For example, other paradigms prefer to conceptualize God in terms of three or four or ninety-nine. From a psychological phenomenological point of view, human nature shows up in different ways of being in the world with differing worldviews and accompanying ways of experiencing, perceiving, understanding, evaluating, and responding to the world. From the Enneagram perspective, these differing ways of living can be grouped into nine lifestyles, again with the disclaimer that other systems might prefer to sort people into five types or eight types or sixteen types or no types. In the 1920’s Eduard Spranger wrote a book Types of Men (1928) expressing his view that people are best understood through the study of their values. Forty years later Gordon Allport, the father of personality psychology, proposed that our personal values are the basis of our philosophy of life. Using Spranger’s list of six values, Allport, Vernon, and Lindzey (1960) constructed a Study of Values inventory. Spranger’s types are remarkably similar to six Enneatypes. His Social Person is like the Enneagram’s Style Two; his Economic Person mimics Style Three; the Aesthetic Person resonates with Style Four; the Theoretical Person resembles Style Five; the Political Person sounds like Style Eight; and his Religious Person blends into Style Nine. Spranger didn’t catalog the Enneagram’s One, Six, and Seven styles, thus missing out on dedication, security, and fun! Our motivations and perspectives are influenced by the values we are attracted to and prize. At the heart of each person’s orientation to the world lie certain aptitudes and abilities. We experience these energizing talents as values or ideals. While all of these endowments and values are present as potentialities in our core self and while we are capable of appreciating and actualizing all of them, temperamentally we favor some over others and our values stack into a hierarchy, with one or a few being more potent than others. These values are the motivating and organizing tendencies that become central for each person, guiding our energies, perceptions, attitudes, emotional responses, and behaviors. We organize our life around these values which lie at the root of who we are and who we are striving to become. Values orient and focus our vision. They tell us what’s important and what to live for; they give our lives direction and purpose. From the Enneagram perspective, there are nine sets of values and visions that are at the core of our bent or distorting personality styles. Style One: What do perfectionistists really want? They want to be good persons. They value and are attracted to goodness. They want to realize all their potentials and help others actualize theirs. They envision making the world a better place to live in. Style Two: What do helpers really want? They want to be loving. They want to nurture others and foster relationships. They value and are attracted to love. They envision making the world a more loving place to live in. Style Three: What do achievers really want? They are attracted to and value productivity, industry, competence. They envision making the world more productive, organized, efficient and smooth running. They want to really make it a cosmos, a harmonious and orderly system. Style Four: What do people who aspire to be special really want? They want to be unique individuals who value originality. They envision putting their personal touch on everything they are involved in. They also value beauty and want to make the world a more beautiful place to live in. Style Five: What do intellectuals really want? They value and are attracted to wisdom, understanding, knowledge, truth. They want to make the world a more enlightened place by discovering what is real and true and making it more intelligible. Style Six: What do a fearful people really want? They want to make the world a safer, more secure, more reliable, more trustworthy place to live in. They are attracted to and value loyalty and stand by their commitments. Style Seven: What do epicures really want? They want to enjoy life and experience all its possibilities. They value joy and variety. They envision making the world a more delightful place to live in. Style Eight: What do bullies and bosses really want? They want to live life fully and freely. They are attracted to, appreciate, and effectively use power. They envision using their strength to influence others and bring about a more just world where power and resources are equitably distributed. Style Nine: What do peacemakers really want? They want to feel at one and at home. They value peace, harmony, and unity. They envision making the world a more harmonious, ecumenical, and comfortable place to live in. So what happened to these healthy core values that got them distorted into exaggerated caricatures of themselves? To answer this we need to look at our vulnerabilities. Vulnerabilities are the tender underbelly of our values. We are most sensitive around those areas where we are naturally gifted and which we most prize. Where our strengths are, there lie our weaknesses. When our values are assailed, discounted, derided, or in any way violated, we feel threatened and frightened. When our strengths are challenged, impugned, distrusted, or dismissed, we feel anxious, guilty, ashamed, and angry. Every person shares common human needs such as those for security, consistency, esteem, acceptance, etc. When these basic needs are satisfied, then higher needs for self actualization and self transcendence come to the fore and attract our energy. If certain basic needs are not attended to and fulfilled, then we experience vulnerability around them, accompanied by loss, hurt, fear, and anger. Our energy gathers around these needs to proactively get them met or to reactively shield them, making sure we don’t get re-traumatized or neglected again. The anxiety we experience around our area of vulnerability remains with us throughout our lives and, to a greater or lesser extent, so do the defenses we’ve developed to guard our vulnerable areas to assure we won’t get hurt that same way. Just as our body forms a hard protective scab around a physical wound, so does our personality style form as a protective covering around our emotional vulnerabilities. Part of our defensive fortification system involves magnifying and exaggerating our strengths. If our strength lies on the sea, we increase our navy; if our strength lies on land, we bulk up our army; if our advantage lies in the air, we buy more planes. Or we double the width of our walls, moats, head size, waist-line, etc. Under attack we become more perfect, helping, successful, special, distant, faithful, scattered, aggressive, automatic, etc. The teacher asked the class to hand in their pictures and began looking through them. Clare hoped she would like her drawing and maybe even show it to the class. Sure enough that’s just what the teacher did. She held up Clare’s picture and asked the class if they had ever seen an orange person. Wasn’t it odd that someone would draw a person orange? Why would anyone draw an orange person? She then put Clare’s picture down and went through some other drawings. So now Clare felt ashamed, having been publicly humiliated. There are several ways she could have responded to this event, depending on how resilient she was and depending on what personality style she might be. If she were an EIGHT, she could put out a contract on the teacher and that would be the end of the matter. If she were a SIX, she could call her father, or better, her father’s attorney. If she were a TWO she could ask the teacher if she could stay after school and clean the boards for her. As a ONE she could decide to roll with the punches and affirm that she herself was O.K. and that the teacher was having a bad day. Actually the teacher had many bad days and was fired at the end of the year. But the injury was done. What have other authors said about vulnerabilities? Michael Balint, a British object relations analyst, labels these areas of sensitivity basic faults (1979). D.W. Winnicott, a fellow object relations theorist, calls them primary agonies (1986). Susan Nathanson Elkind (1992) refers to them as primary vulnerabilities. One broad area these vulnerabilities touch is our sense of self. We want to experience ourselves as whole, lively, cohesive, continuous, and worthwhile. We feel vulnerable and anxious when we experience our self as partial, deflated, fragmented, disintegrated, diffused, or worthless. Another general area of vulnerability has to do with our relationships. We seek to maintain, preserve, and enhance the bonds and connections we have with significant other people in our lives. We feel vulnerable and anxious when we experience separation, abandonment, neglect, rejection, betrayal, or being unwanted. Since we are selves-in-relation, we want to remain in relationship while striving to separate and individuate our selves. Throughout our lives we seek to balance this polarity of autonomy and communion. Through the interactions between what we bring with us into the world and who and what we meet in the world, we learn which behaviors, feelings, thoughts and images will preserve and enhance our connections to others, maintain a coherent sense of ourselves, and nurture and protect those values we are naturally attracted to. These mental inner object relations or representations of self-other-interactions become templates or maps for guiding our relationships for the rest of our lives. All of us share these basic human needs and we are all exposed to these primary vulnerabilities. How acute, disturbing, disruptive, and anxiety provoking they become depends on our nervous system and how we were raised. If our constitution is basically healthy and hearty, we can negotiate these vulnerabilities and remain whole and connected. When we are born into an “average expectable environment” and our parents or caretakers are “good enough,” we will still experience these primary vulnerabilities but will do so in the company of loving advocates and guides. And we can negotiate these vulnerabilities with resilience and confidence and a tolerable dose of anxiety. But if our constitution is enfeebled and/or our parents had their own share of primary vulnerabilities that they weren’t equipped to deal with, then we will be exposed to these vulnerable areas without someone to help us through them, someone who holds us and processes these vulnerabilities for us until we learn to do it for ourselves. Being healthy doesn’t mean being without needs and vulnerabilities. It involves recognizing and acknowledging our needs and then effectively negotiating to get them met. A less resourceful approach is to build a battlement around our vulnerable areas, which keeps us safe and secure, but doesn’t get our needs met. People living in fortresses eventually run out of supplies or become bored to death. In some spiritual traditions, such as those congenial to the Enneagram, this resourceful self is called our essence while the less-resourceful self is called personality. Essence is our original self; personality is our compensatory caricature self. Essence is proactive, leading us toward our values. Personality is reactive, putting up protective barriers around our primary vulnerabilities to make sure we don’t get hurt again. Much “inner child” work has to do with uncovering and healing the wounds and vulnerabilities we sustained and endured as we were growing up. We discover where the child within us is hiding, how she hides herself, what she is hiding from, and what she really needs for herself. By suggesting where our sensitivities lie, the Enneagram model can be a useful guide in our search for and reconnection with our inner child with his or her fears, vulnerabilities and defenses. The Enneagram perspective points to nine clusters of primary vulnerabilities that naturally accompany nine sets of values. The values, vulnerabilities, and compensatory strategies of the nine personality paradigms are summarized below. A fuller description of how each type deals with these vulnerabilities will follow. One Sore Spots — Valuing being good and taking pride in being right, ONES are especially sensitive to criticism and being told they are wrong. Their perfectionist style is a way of assuring they won’t be criticized. You can’t criticize them if they’re perfect or blame them as long as they’re trying really hard. Two Sore Spots — Valuing relationships and taking pride in being loving and generous, TWOS are easily hurt by rejection and by a lack of attention and appreciation shown them. They are sensitive to feeling useless and unneeded. Their rescuing style is an attempt to gain recognition, gratitude, and acceptance and to make themselves necessary and important in the lives of others. Three Sore Spots — Valuing success and taking pride in their accomplishments, THREES are hurt by rejection and failure. Their achieving style is an attempt to be successful and to maintain relationships through performing and doing for others. Their concern about image and looking good has to do with getting people to like them. Four Sore Spots — Valuing relationships and belonging and taking pride in being special, FOURS are easily hurt by feeling abandoned or left out, or by going unnoticed. They are sensitive to feeling flawed, undesirable, unwanted. Their style of being special is an attempt to get others to notice them and keep others connected to them. Five Sore Spots — Valuing privacy and their own personal space, and taking pride in their knowledge, FIVES are easily spooked by being invaded, having demands and expectations put on them, and being deprived, belittled or ridiculed. Their knowing and loner style is an attempt to ward off intrusions, be self sufficient, and avoid looking foolish. Six Sore Spots — Valuing fidelity, consistency, and security and taking pride in being loyal, SIXES are scared by perceived threats and challenges. They are vulnerable to being caught off guard and to the misuse of authority. Their phobic style (loyal and dependent) or counter-phobic style (rebellious and independent) are two sides of the same coin which seeks to purchase safety and security. Seven Sore Spots — Valuing enjoyment, freedom, and variety and taking pride in being upbeat and resourceful, SEVENS are brought down when their options are limited. They are deflated by having their balloons burst, parades rained on, and parties pooped. Their sunny-side-up style is an attempt to stay on the high side of life and experience as much as life has to offer. Eight Sore Spots — Valuing justice and autonomy and taking pride in being strong, EIGHTS are particularly irked by being neglected, being unjustly treated, and feeling powerless. Their powerful style is their way of being in charge and guaranteeing they will be heard, won’t feel weak, and won’t be taken advantage of. Nine Sore Spots — Valuing unity and harmony and taking pride in being settled, NINES are especially wary of and torn apart by conflict. They are easily hurt by neglect. Their relaxed, resigned style is an attempt to defend against feeling uncared for and having to assert themselves — which might disrupt the flow of the universe. To summarize what we’ve said so far: Values tell us what’s important to us and what to look for. Vulnerabilities tell us what’s threatening to us and what to look out for. Both influence and guide our vision or world view, our outlook on and orientation to the world. When we are motivated by and focused on what we genuinely value, our vision tends to be clear, adaptive, and aligned with reality. Our values intuitively lead us to what is really there. When we are focused on our vulnerabilities and what we are afraid of, our perceptions are more likely to be opaque, maladaptive, and distorting of reality. We fantasize what we are afraid is there or what we expect to be there. Let’s look more closely at the vulnerabilities and defensive maneuvers of the nine styles and see what the Enneagram suggests are more effective responses to perceived danger and threats. The primary vulnerability for ONES, the interpersonal transaction they are most sensitized to, is being criticized. Being found at fault is hurtful, shameful, threatening, damaging, and the pain ONES most want to escape. To avoid being censured, with the wounding and possible rejection it entails, is the raison d’être of their personality. ONES are also quite sensitive about being wronged as well as being wrong. Their radar scans for any signs of injustice towards others or themselves. When ONES’ assess that they are not right or good enough, or when their inner censors pick up the scent of being judged to be wrong, their panoply of defensive maneuvers goes into action. The banner of their idealized self image “I am right” is unfurled and waved in your face; their righteous anger and resentment come front and center to energize them and guard the gates of their self-esteem; their defense mechanism of reaction formation is deployed to insure they do the right thing and to assure that they are right and you are wrong; they cover their flanks and screen their awareness lest any unacceptable faults enter their field of consciousness. We can tell when our area of primary vulnerability has been breached when we mobilize for war with minimal provocations. At this time of perceived maximum threat, the Enneagram suggests that ONES need to shift out of the “red alert” sounded by their ego and shift into their essence. They need to stay centered in their real self in the here and now, switch from critical judgmental mode to aware and discerning mode, and remind themselves to remain serene. From this objective resourceful state they have a clear perspective and multiple options to care for their primary vulnerability. Acting from their stressed-out less-resourceful subjective state gives them a distorted view and limited emotional and behavioral responses to protect their vulnerable self. ONES need to remember that what they really need and want is to be accepted for who they are and all they bring, to feel good and right about themselves, and to be respected and loved. While their defensive strategies keep them safe and guarded against criticism, they don’t guarantee their deeper desires will be met. Ironically their angry “I am right” approach gets in the way of their real needs being satisfied and may even bring about the very thing they fear: more criticism and rejection. The more ONES proclaim their rightness, the more others take potshots at their faults. Being alone and separate are touchy areas for TWOS. Because they value relationships and being connected, they are particularly sensitive to interpersonal interactions that they perceive to be rejecting, disconnecting, isolating, betraying, or abandoning. Criticism is interpreted as not being loved. When their vulnerability to rejection is threatened, their maladaptive schemas are likely to arise. Their defensive strategies are designed to assure that they won’t be rejected and left alone. If they sense any kind of disconnection or abandonment, their false personality takes over and trumpets their self- image of how helpful they are; their pride puffs them up and energizes them for service; they repress their needs and adapt themselves to the needs of others. “If I’m important to you and meet all of your needs, you won’t want to leave me.” Who in their right mind would want to disconnect their indispensable umbilical cord, iron lung, or kidney dialysis machine? TWOS make a living out of being selfobjects, to use Kohut’s terminology, doing for others what others need to internalize and do for themselves. Paradoxically this very strategy necessitates the TWOS abandoning themselves by leaving their needs behind. Their reactive strategy brings about the very thing they are seeking to avoid. By helping and serving others before others have a chance to spontaneously express their affection for and affirmation of them, TWOS are never sure whether others really care for them or whether the TWOS have once again cajoled this connection and closeness. And when TWOS are overly solicitous and smothering, others tend to push them away or move back from them. Thus the TWOS’ helping strategy backfires and they end up feeling rejected and abandoned, which is just what they dreaded all along. So their defensive strategy doesn’t really get them what they want, which is to feel connected, cared for, loved, wanted, and needed for themselves not for what they can do for others. If TWOS stay centered in their authentic self when their primary vulnerability is threatened, they can tolerate a give and take to occur. Their essence allows the alternating current of love to flow into them as well as out of them. The virtue of humility breaks open the soil of their psyche so it can soak in the caring that is available if only TWOS will drink it in. For grace to be received, TWOS must be open to it. Their inner freedom grants God and grace permission to enter into their real self and then be channeled to others. What God wills more than anything else is that we experience ourselves as loved and then spontaneously return that love. Like ONES and TWOS, THREES report being sensitive and susceptible to criticism and rejection. They feel hurt when they are not paid attention to or don’t receive recognition. Failures in relationships are the ultimate failures for THREES. Their projects and performances are done to get admiration. And when approval is not evident, THREES interpret this as failure. THREES also say they feel vulnerable when they are forced to be inactive (through lay offs, health problems, etc.). They then feel useless and not worth anything. Intimations of failure are likely to trigger their maladaptive schemas. When THREES find themselves approaching any kind of failure experience, their defensive mechanisms go into high gear. Their self-image of being successful is highlighted, their marketing strategies pick up, and they deceive themselves and others into believing they are important because of all they can achieve. Since I perform well, please others, and accomplish great things, why would anyone want to reject me? As THREES get anxious, their self recedes and their image and projects take center stage. Unfortunately this maneuver just prolongs the THREES’ doubt about whether they are loved and affirmed for themselves or for their productions. Their accomplishments, images, and roles come between their real self and others’ real selves. Paradoxically their defensive approach is ultimately not successful because THREES can’t maintain their charade forever. Eventually others realize the person behind the mask is not present. Interacting through a persona or as a productive machine is not satisfying for either THREES or others. Relationships become distant and separation ensues. Also THREES get so caught up in all their works and projects that they don’t have time to enjoy the relationships they do have. And so their defensive maneuvers thwart their genuine needs to feel accepted and affirmed for being vs. for doing, to be liked and acknowledged for themselves, to be authentically responded to, and to have a life that has significance and meaning. The hope provided by their essence enables THREES to remain truthful and bonded to themselves and others when their primary vulnerability is threatened. Their real self remains present and engaged and is thereby most effective. Only in genuine I-Thou relationships do their real selves get the belonging and affirmation they really desire –which they may have mistakenly sought through the achievements of their false selves, or it-it transactions. As is the case with every other unsuccessful egoic approach, the way out of our dilemma is the route we least want to take. And so, paradoxically, the way to get unstuck for THREES is failure, the condition they most want to avoid. Yet an inordinate number of THREES say that experiencing failure was precisely what broke the trance of their compulsion. It shattered their successful image and allowed their real self to emerge. The failure of a marriage, the mental illness of a child, the bankruptcy of a company broke their quest for a perfect 300 game and splintered the successful illusion of their personality. While initially awful, failure ultimately brought freedom and peace. A primary vulnerability of all human beings is the fear of being abandoned or rejected. Some personality theorists would say this is the primary human vulnerability. Being abandoned is certainly what a helpless infant and child fears most and this anxiety diminishes very little in adults. It is the area of vulnerability that FOURS are most acutely sensitive to. They are fearful of being left out or left behind and are hurt by feeling neglected, ignored, and uncared for. FOURS are also vulnerable to feeling flawed, defective, unwanted, and uninteresting. They report they are sensitive to being criticized about their style or taste and are hurt by any lack of recognition of their creativity. When these areas of vulnerability are breached, the FOURS’ maladaptive schemas are likely to arise. The ego strategy that FOURS devise to keep themselves from being abandoned leads them to abandon their authentic self which is the real basis of their feeling lost, unnoticed, and unwanted. They miss themselves. FOURS often devalue and reject themselves before others have a chance to. Having left themselves behind, they must seek outside to complete themselves. As is the case with the “neurotic solutions” of other styles, the FOURS’ strategy of being very intense or very attached may paradoxically scare people away. Or they may reject others first before any suitors predictably abandon them. Tragically their defensive tactics frustrate their authentic desires to belong, to discover themselves, to be original, to be ordinary, and to feel connected to others. If FOURS remain moored to their essence when their primary vulnerability is threatened, they will be authentic and they can engage the essences of others and feel related. If they move to envy, they contact their false personalities and the false selves of others and feel lonely. Their adaptive self keeps them attuned to reality instead of to their fantasies, while their virtue of equanimity leads them to their commonness that relates FOURS to all other creatures. Ironically, what they fear most, being ordinary, brings them to what they desire most, being connected. Primary vulnerabilities for FIVES include feeling deprived and emptied; feeling intruded upon and engulfed; feeling exposed and foolish. FIVES report they are also sensitive to becoming too visible, being evaluated or put down, feeling inadequate and lost, being dependent, and living someone else’s life. These are the interpersonal events and early woundings their defensive style hopes to prevent from ever happening again. If these sensibilities are piqued, the FIVES maladaptive schemas may become operable. FIVES’ hyper alert radar is continually scanning for any signs of invasion, encroachment, expectation, demand, deprivation, or ridicule. If any hint of these threats appears on their radar screen, they deploy their distancing and intellectualizing apparatus, become driven by their greedy grasping for knowledge and invisibility, avoid their feelings and involvement, detach, and move up and away from the scene as helicopter-like as they can. Unfortunately, FIVES’ strategy brings about the very thing they’re trying to avoid. Since nature abhors a vacuum, as FIVES retreat, others follow. Their withdrawing invites further intrusions. Or if they remain a blank screen and say nothing, others will fill in the blank by projecting their own interpretations about what the FIVES are thinking, feeling, etc. And these projections could be worse than anything the FIVES might actually be imagining. While the FIVES’ non-resourceful strategy keeps them hidden, at a distance, and safe, it doesn’t get their deeper needs for affiliation met. What FIVES really need and want is to be themselves in relationships, to connect with others without disowning themselves. They want interdependence not hyper-independence; they want privacy but not isolation. FIVES want to understand and be understood and to be appreciated for having knowledge. They want to feel competent — physically, socially, and emotionally as well as intellectually. When they’re feeling vulnerable, FIVES need to remain centered in their essence (not to be confused with their cave), detaching themselves from their hiding place but staying connected to themselves while engaging with others. They need to shift from withholding to holding with. In other words they need to stay in the game, moving towards or against others instead of moving away from what is happening. The primary vulnerability for SIXES is being betrayed and caught off guard. SIXES got surprised, disappointed, and hurt enough times that they developed a personality style to protect them and guarantee they wouldn’t get caught off guard any more. Their wary lens searches for hidden intentions and looks over their shoulder to protect them from sneak attacks. Betty, a SIX, related this incident that happened to her when she was a little girl. Her father came home one day and told her they were going to the ice cream parlor. Delighted, she excitedly followed him. They got in the car, drove past the ice cream store, and on to the dentist’s office! And you wonder why SIXES are suspicious, why they are ambivalent about trusting authorities, why they seek to know what others really mean, and why they get into the habit of second guessing. Because Betty thought of herself as a loyal person, she valued being trustworthy and keeping her word. So she was particularly sensitive to any kind of betrayal or abuse of trust. She was disappointed and hurt by her father’s deceit and honed her personality style to make sure she wouldn’t be caught off guard like that again. Exaggerating her vigilant qualities, she cultivated a wary and cautious life style, probing others’ statements to discover what they really meant behind what they said. Like: “What do you mean, ice cream store?” Developing compensatory strengths around her primary vulnerability, Betty became a very loyal hyper-alert, employee. SIXES also say they are just as sensitive to betraying others as they are to being betrayed. They can be harshly critical of themselves if they disclose others’ confidences or if they are unable to do something they promised to do. Vulnerable to feelings of insecurity and reactive to inconsistencies in others, SIXES are sensitive to disruptions and a lack of order. They are fearful of being thrown out of the group or of being given responsibilities before they have the abilities. They don’t like to feel trapped and are sensitive to being deceived or treated unfairly and not being heard or listened to. As these sensitive situations arise, so do the SIXES maladaptive schemas. What SIXES really need and want is to feel safe and secure, to experience consistency, to belong to a group where they feel accepted and OK, to be listened to and have their side taken, to be connected even when they’re afraid. While their defensive strategy appears to keep them safe, it really doesn’t secure the fulfillment of their deeper needs. Paradoxically their paranoia guarantees that people will begin talking behind their backs. Their fearfulness attracts predators and their doubts incline others to take over for them. The more tightly they constrict their borders, the more potential friends and allies they exclude. Their fears magnify and create dangers where there aren’t any. And when SIXES sense danger, deception, or betrayal, they deploy their personality arsenal. They scan for enemies and hidden intentions; they heighten their worries and fears to be alert and prepared; they project their own untoward intentions onto others so they feel pure and so they’ll always know what’s coming their way — themselves; they embrace, avoid, or challenge authorities to feel safe. In the moment their primary vulnerability is breached, when they fear they are being blind sided, caught off guard, or betrayed, SIXES need to seek the sanctuary of their essence where they are ultimately safe and secure, for nothing can disable their essence except their own self doubt. In their real self they find the courage to be and this fortitude provides a resourceful energy for SIXES, enabling them to feel their fears and deal with them calmly and directly. SEVENS are particularly sensitive to being limited by having their options curtailed. They also have a great fear of being boring or being bored, like being in a routine job or a mundane relationship. SEVENS believe they should have it all – – or at least try it all. Feeling tied down, pinned down, or committed are quite anxiety provoking for SEVENS. Feeling trapped, immobilized, paralyzed, sick, or lifeless are variations of this stuck theme. SEVENS also report they are very sensitive to pain, suffering, depression, hurt and other dysphoric feelings. They are vulnerable around a lack of hope or encouragement. Their defense against being focused or contained is to scatter. It’s hard to capture a moving target like a wily coyote. SEVENS jump around in their fantasies and so earn the sobriquet “scatterbrained”; move around in their careers and become Jacks and Jackies of all trades; shuttle around in their relationships and become promiscuous; or travel around the globe and become nomads. Diffusing themselves through multiple interests and defusing others through humor are ways SEVENS keep from being bogged down. Some of the SEVENS’ maladaptive schemas might appear when they’re feeling threatened. When SEVENS start to feel restricted, inadequate, and not all right, they trumpet their self-image of I’m O.K., activate their vice of gluttony, head “downtown” to avoid any unpleasantness or pain, and sublimate to the max. Paradoxically, the pursuit of unlimited pleasures is in itself quite limiting. While SEVENS gain mobility, they lose stability; they get to travel but don’t have a home; they gain variety but miss out on depth; they have the Yin without the Yang. They live in a land of never-ending sun. How boring is that? Like the rest of us, what SEVENS really want is to be happy. They want to be both free and committed; they want to have choices within commitments. While their defensive approach provides them with options, it may not give them satisfying long-term relationships. When SEVENS are feeling vulnerable, they need to keep in touch with their true self by staying sober in the present, keeping focused, and trusting and remaining connected to whatever is real — which may include suffering and pain. True happiness, according to Aristotle, is a by-product of action. If sought directly, it is evanescent. It is experienced through persistently working with reality in the here and now. The areas of vulnerability that EIGHTS are especially sensitive to are being unjustly and unfairly treated, being neglected, and feeling powerless. They don’t like feeling limited, dependent, subordinated, not in control. They want to do what they want, when they want. Having to be docile in the presence of an incompetent or abusive authority is particularly onerous and maddening. EIGHTS do not like to be figuratively bound and gagged around people they don’t respect. Quite the contrary their style is designed to prevent this from happening. EIGHTS feel better speaking their mind, stating their objections, and making their observations of ineptitude even if it means getting fired, divorced, ostracized, etc. They would rather form a new corporation, relationship, or gang. Their approach to not being heard or paid attention to is not the coward’s way of withdrawing to the sidelines, hoping to be seen, nor the diplomat’s way of subtle negotiation and compromise. EIGHTS get heard because they are forceful and persuasive. If you didn’t hear them the first time, they’ll tell you again and keep telling you until you acknowledge their position. Or they cause a commotion. Embarrassment and intimidation can be the EIGHTS’ manner of communicating. For example if the garbage in their neighborhood is not being picked up promptly, they might first write a letter to their alderman. However, if there were no response, the EIGHTS would then organize all the neighbors to collect their garbage, dump it on the alderman’s lawn, and picket his or her house until humiliation and bad publicity prompted action. Victory does not belong to the subtle. When adversity arrives, some of the EIGHTS’ maladaptive schemas may arrive with it. The EIGHTS’ style of life is an attempt to guarantee they will not be treated unjustly or unfairly again. They become the justice makers, meting out rewards and punishments. Standing up for themselves and for the disenfranchised, they don’t permit any power to be taken from them without a fight. They follow an “eye for an eye” diplomatic policy, deploying vengeance as a way of restoring equity, the balance of power. What EIGHTS eventually discover is that their aggressive approach to life brings about the very things they fear. Anger begets anger; aggression leads to retaliation; power plays invite counter-maneuvers; dictators provoke revolutions; the world does indeed come to be hostile and dangerous. If EIGHTS become too sociopathic, they are put in prison where their worst fears of being limited and not in control are realized. What EIGHTS really need and want is to feel in control of themselves and their surroundings, to be respected, accepted, and approved of, to be treated justly and equitably, to be persons of integrity and honor, to be self-determined and their own person, to be spoken up for. Their defensive strategies might keep them in charge and in their castle, but they don’t necessarily bring them respect, compassion, or companionship. When they are feeling threatened, EIGHTS need to stay centered in their essence instead of shifting into their street-fighter personality. Their real self exudes an aura of innocence: “Why would anyone want to hurt me and why would I want to hurt anyone?” Allowing justice to be administered by a power higher than themselves and entrusting themselves to this authority, they find they are powerful in ways they never imagined. The early wounding that NINES experienced resulted from their perception that they didn’t matter, weren’t that important, and weren’t worth being noticed or cared about. NINES say they are sensitive to being neglected, feeling shamed, crushed, or left defenseless. They are sensitive to conflict, confrontation, disharmony, and to being criticized or punished for hurting others out of anger. Instead of facing this painful reality that, apparently, they didn’t matter that much to their parents since their parents didn’t show them much attention, NINES assumed the less painful stance of resignation. They took the attitude of: So what? It doesn’t matter (which is less painful than I don’t matter.) What’s the difference? Why make a big deal out of anything? Life is short, anyway. So NINES resigned themselves and settled in for the duration. They turned down their energy, lowered their expectations, and began their long hibernation. NINES weren’t listened to and so they learned to not listen to themselves and their needs, preferences, wants, feelings, and own ideas. No one asked them what they thought, valued, or wanted and so they subsequently forget to ask themselves. As adults, NINES often don’t know what kind of person they would like to be, what kind of work they might like to pursue, or what kind of partner they prefer to marry. When their sensibilities are stepped on, the NINES’ maladaptive schemas surface. Whenever their desires and wants become figural, the NINES’ automatic response comes into play to push them into the background. They defocus, distract themselves, become indolent, avoid conflict, and fall asleep. And, as we have seen with every other type, the NINES’ defensive strategy eventually creates the very situation it sought to avoid. The more NINES blend into the background, the more non-descript and bland they become, the more they go unnoticed and neglected. Procrastination makes matters worse and eventually heightens conflict. Ignoring a tumor doesn’t cure it; it grows through neglect. While their ego’s solution might keep them calm, it doesn’t bring them what they really want and need which is to be loved, cared for, and noticed. Also, along with garnering esteem in the eyes of others, NINES need self-acceptance and self-esteem. They want to be at peace with their inner feelings, especially their angry ones. They want to be proactive and speak up for themselves. And, while doing so, they want to maintain their sense of union and harmony. They want to experience inter-being. What NINES need to do when their vulnerability is breached is stay in touch with their essential feelings, preferences, and values, let them emerge, and act on them. They need to trust that their passions will not irrevocably disturb the harmony of the spheres. Actually their desires are part of the energy system of the universe that keeps it evolving through a process of differentiation and integration. NINES need to honor both the polarizing as well as the harmonizing dimensions of the evolutionary process. The following chart summarizes this 3-V look at the Enneagram. Well, actually, it’s up to 4-V’s now, since I added Virtues and Vices. We are motivated by and attracted to certain values that we prize and want to promulgate. When others are not so enamored of our values, we can feel hurt and sensitive around our trampled treasures. Vulnerabilities are the tender underbelly of our values. If we deal with our vulnerabilities in resourceful ways, our values are projected as ideals which inform our visions of how we would like to be and how we would like the world to be. These visions contain adaptive cognitive schemas that are accompanied by adaptive emotional schemas or virtues. Our visions and virtues lead to the actualization of our authentic self. When we react to our vulnerabilities in a defensive manner, our values appear as idealizations, exaggerated self images of how we think we should be in order to survive. These idealized self images are distortions of our genuine values and give rise to maladaptive cognitive schemas about who we are and what the world is like. These warping visions get energized by vices, the distorted expression of our life energy. The combinations of wrong ideas plus bad vibes represent the ego’s attempt to maintain the integrity of the self. Ironically, though, it’s the personality that gets preserved while the genuine self remains hidden. Allport, G.W., Vernon, P., & Lindzey, G. (1960). A Study of Values (3rd ed.). Boston: Houghton Mifflin. Angyal, A. (1965). Neurosis and Treatment: a Holistic Theory. New York: John Wiley & Sons. Balint, M. (1979). The Basic Fault: Therapeutic Aspects of Regression. New York: Brunner/Mazel. Elkind, S. (1992). Resolving Impasses in Therapeutic Relationships. New York: Guilford. Spranger.E. (1928). Types of Men. [P.J.W.Pigors (Trans.)] Halle, Germany: Niemeyer. Winnicott, D. (1986). Fear of Breakdown. In G. Kohon (Ed) The British School Of Psychoanalysis: the Independent Tradition. New Haven, CT: Yale University Press.